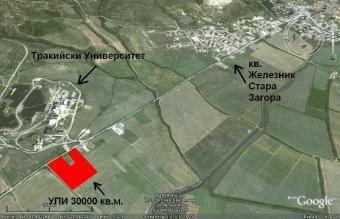 The plot has the following characteristics: 30 000 s in Stara Zagora city. The plot is under regulation. The plot looks towards the main road and is situated across Trqkia University. There is a project for building mall on the plot but the project can be changed. There is an option for additional 3000 sq. metres next to the plot. Price: 30 euro without VAT. The price can be negotiated. The price for the additional 3000 sq. metres can be negotiated.